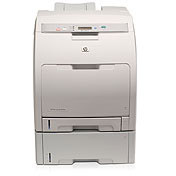 Workgroup devices like the HP Color LaserJet 3000dtn printer offer fast and efficient printing for any midsize office. This particular model can print up to 30 pages per minute (ppm) and boasts a 600 dots-per-inch (dpi) resolution. It’s capable of printing on a wide range of media sizes and offers ethernet connectivity to facilitate smooth, seamless office print jobs. No matter what line of business you’re in, buying HP LaserJet 3000dtn toner can be expensive if you purchase original equipment manufacturer (OEM) cartridges. Many consumers think that their only options are paying OEM prices or buying inferior, cheap toner from disreputable retailers. Finally, thanks to 1ink.com, you can get OEM quality at an affordable price. These remanufactured HP 314A toner cartridges give you the same incredible print quality, two-year shelf life, and page yield (6,500 pages in black and 3,500 pages in color) as OEM products. You’ll save over 50% off the OEM price with 1ink.com, but you’ll still get the same professional results that you’re used to from using OEM HP toner – the biggest difference that you’ll notice is the price.